When "Soupergirl" began getting press several years ago, I was pretty intrigued with Sara Polon's unique business model. Basically, she makes soup, you order the soup, then you pick it up at a location near you. Simple, huh? So, I started ordering soup from her a few years ago. Each week I'd place my order by Thursday, then my soup would be delivered the following week to a store in my neighborhood and I'd be able to pick it up Tuesday through Thursday. She offers two sizes -- a pint for $6.75 or a quart for $12.75. All of Sara's soups are made fresh with locally-sourced ingredients. In fact, it was only after reading The Omnivore's Dilemma that she was inspired to become part of the local food movement. Her mother, Soupermom, had always made amazing soup so she and her mom decided to start a business based upon soup. Soon after starting the business, Sara decided to go all-vegan by only making vegan soups and only selling vegan products including cornbread and brownies. I was so delighted when she started offering vegan cornbread! The selection of soups changes weekly, but all are amazing. The soups have this amazing base, are low in salt, and did I mention they are all vegan?! 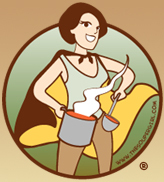 I've loved most of the soups I've gotten from Soupergirl. Her business has been so successful that on top of her delivery business, she recently opened a storefront in Takoma Park, MD. A few weeks ago, I went there to check it out and was amazed at how cute it was. It is a small cafe with glass windows and a big, bright Soupergirl sign. The cafe sells all of the same things she sells to her delivery customers including soup, croutons, cornbread, salads, and brownies. In the store, you can either help yourself to fresh soup from the kettles or you can grab a soup to go, which is already conveniently packaged for you. On this occasion, I grabbed a tortilla soup to go. I was delighted to find that Sara herself was ringing up my purchase. It was great to finally meet the Soupergirl herself. The tortilla soup was as delicious as I had expected with black beans, tomatoes, corn, tortillas, and spices -- it tasted just like a tortilla. So whether you pick the soup up in your neighborhood or visit her store, which is conveniently located across from the Takoma Park metro station, I highly recommend you try her soup. I don't think you'll find better soup in the DC metro area.